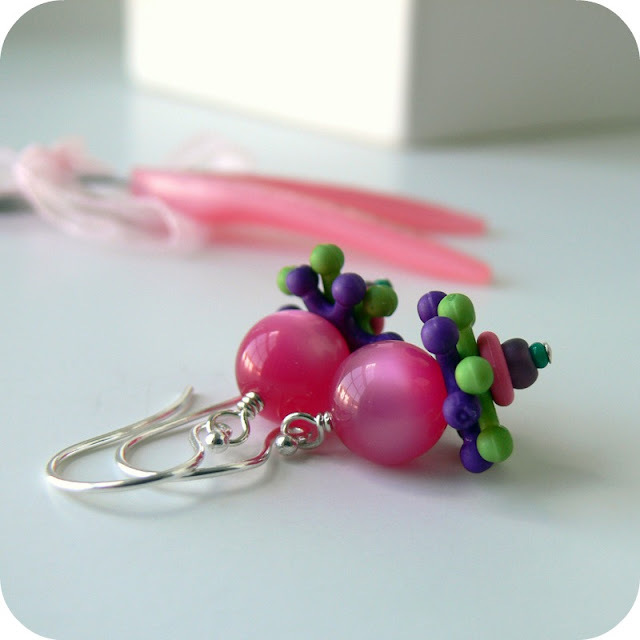 Today I'm happy to show you some cheery earrings I made with beads sent to me for my monthly Cup of Bead Soup project by Genea Beads. If you'll remember, Genea sent me not only her colorful, fun handmade lampwork beads but some interesting, quirky bits from her friend Yvonne. 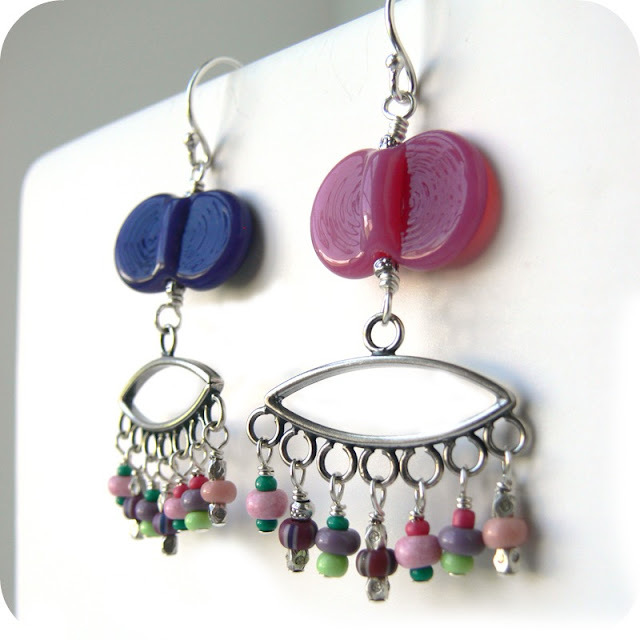 I made three pairs of earrings with a mix of these whimsical beauties, and I hope you like them! First is the funkiest pair, a pair of earrings I think just scream fun and sass and are to be worn by a person with a great sense of humor. They're called "Popsicle Summer" because I think of the little seed beads as drips off the neighborhood ice cream truck's popsicles. I made the earring tops in different colors on purpose, and at first I worried that the range of colors of tiny beads on the bottom would make things TOO out of kilter, but if you notice, there's a pattern to the beads on the bottom -- both earrings have the same beads in the same sequence in the same place. Making something look random when it really isn't is (for me) a lot harder than it looks. The next set of earrings incorporates a pair of Genea's purple lampwork beads, lucite flowers from my stash, and some of the rubber O-rings from Genea's "bits bag". They're called "Circle of Friends". 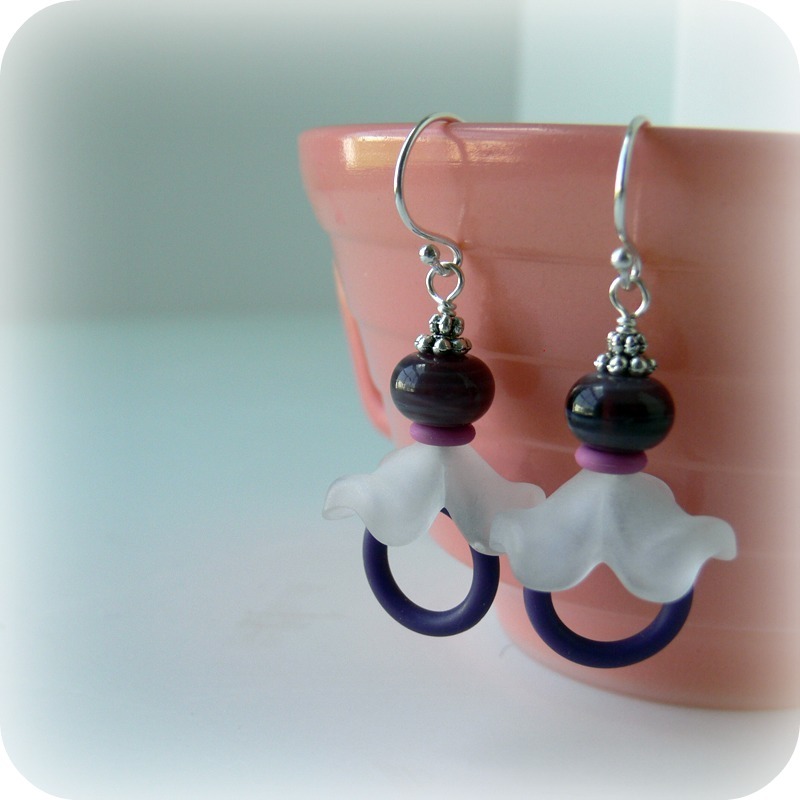 For the spacers between the purple lampwork beads and the frosted white lucite flowers (which you can get from Beadin' Path), I used smaller rubber O-rings -- I thought that was a pretty cool idea. The last set of earrings are made with hot pink vintage lucite beads from my stash and the MOST fun spacers from Genea's "bits bag". These are so cute and so fun, and they're only about 1" long, so while they're definitely colorful, they aren't overpowering. They're called "Whirligigs". those are pretty fun and colorful! Oh these ROCK, Lori! I love the ice cream drip idea for the first set and all the fringy danglies. Ok, the whirlygigs and circle of friends are awesome!!! Love the colors, and that the whirlys look like jacks! Awesome!! Love all the beads and the earrings. "Random" color is my favorite! Once again I love the allllllll! Lori, I like how you picked a type of jewelry to start with (earrings) and created a grouping with Genea's beads. My favorite pair is Whirligigs...and that's a great photo! These are just so pretty and delightful,the colours are amazing. Gorgeous jewellery! I so love how you used the rubber bits. When you first posted those, I was totally bewildered. I thought tomyself: How on Earth to incorporate them into jewellery that's chic and cute? Well, you did it! Super cute. I'm especially fond of the last pair. So cute! Hard to be in a bad mood with these swinging from your ears! Those beads and colors are gorgeous, I love them! And the pictures are awesome! No clue why, but I particularly dig the last pair with the bobbly bead thingies. They make me smile! I love them all! The beads were so beautiful and wow did you make them POP! These are super cute, and I love the pretty spring colors! I don't think one would need any other jewelry but these. Add a cute tee, sandals, painted toenails, and you're ready for anything! Very pretty, Lori!! I love the bright colors! I have to say I love them all but the "whirligigs" are my favorite! I like all of them but I think the whirligigs are my favorite! Oh my, lovely earrings, love them all!! What a neat idea on using the O rings...would have never thought of that! I love the colors. They're all so delicious and lovely! Hi Lori! Thanks for stopping by today! 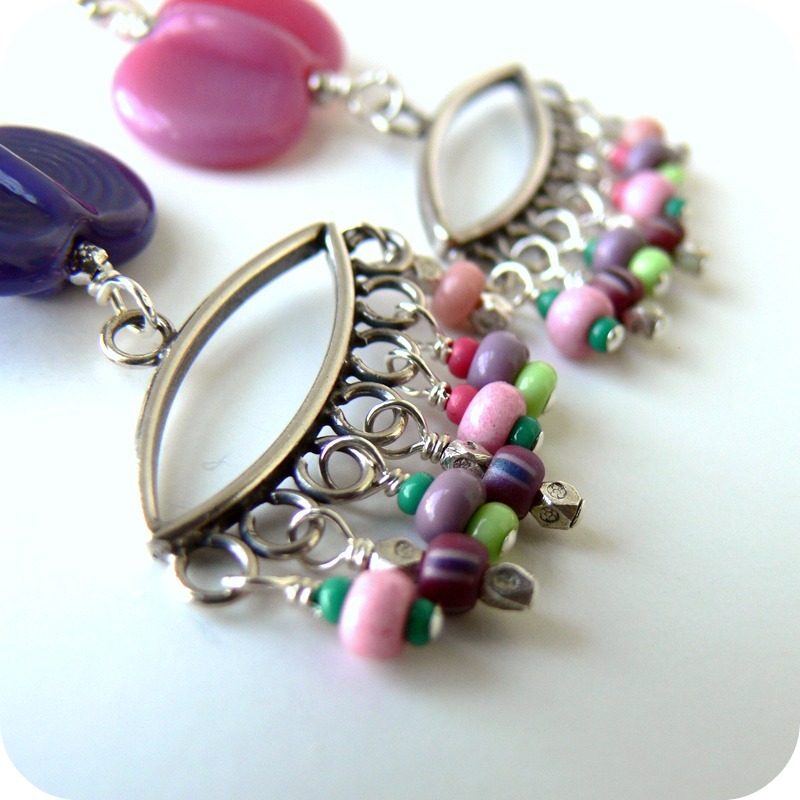 Lovely jewelry, lovely colors! So cute and girly! I love these earrings they have a touch of innocence. I like the simple yet attractive bead designs picked in the soup,it is a pleasure to see such variety of colors and designs.